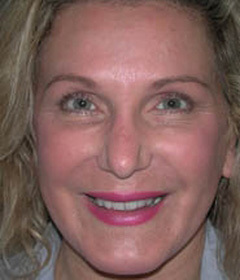 This 48-year-old woman is a great example of the dramatic results patients can accomplish with reasonable regimen of nonsurgical treatments such as BOTOX® in St. Louis. At her consultation, this patient expressed a desire to give her face a younger look without surgery. Her most evident age signs before treatment included slight spotting due to sun damage, as well as some wrinkles around the mouth and chin, and some "crow's feet" around her eyes. For patients with a spectrum of age characteristics, combination treatments are generally more effective because they improve skin quality at the same time as they correct wrinkles. Over the past 5 years this patient has used a combination of non-surgical treatments, including microdermabrasion, BOTOX® Cosmetic, Obagi® Skin Care, and dermal fillers to restore and smooth her skin without surgery. She now enjoys dramatically younger-looking skin that has the added benefit of being much more healthy. The BOTOX was very effective for wrinkles around the mouth, especially in combination with the microdermabrasion and Obagi regimen. The dermal fillers subtly corrected hollows below the patient's eyes to give her a much more confident and energetic appearance. While St. Louis plastic surgery is sometimes necessary for more extensive wrinkling, in the case of milder age signs, combination skin renewal procedures are often sufficient to restore a more youthful, natural look.